“Invasive Species” was an idea of combining natural building materials with completely unnatural materials to produce something fluid and unique. After receiving excellent feedback from the Steel Ribbon series at Faiweather’s, Robert McWhirter, who was introduced as an emerging artist (read more about Robert on our blog posts dated Sept. 04, 2014 and Sept. 15, 2014), entered a piece into the Winter All Juried Art exhibition by Bonnie Laing-Malcolmson, curator of Northwest Art at the Portland Art Museum. Over 300 works of art were submitted with less than 40 making the finals, Mc Whirter’s steel ribbon was one of works of art that were selected. “On the night of the artist’s reception, a window opened to approach Bonnie Laing-Malcolmson and press some questions. Two words were taken away from the conversation, go bigger. The beach was the next stop. There is no better place to appreciate the feeling of the coast, alone, surrounded by wind, waves and wildlife. Nearing a full load of driftwood, preparing to call it a day then two bald eagles flew in from nowhere, circled overhead before gliding. The lightbulb went off. The intent was (with no pun intended) to simply wing it. 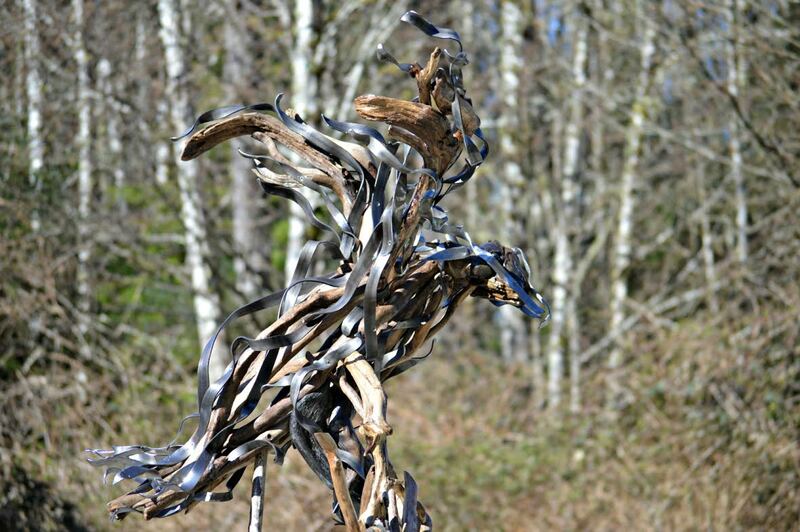 Let the shapes and lines of the wood create the body of the sculpture, let the steel create the flow. Fabrication was a slow and at times extremely tedious effort, however without a proper name to complete the vision and motivation, it was not complete. As said earlier, there’s almost nothing better than being alone on a beach with wind, waves and wildlife. The impact of human presence is abundant; fishing gear, wrappers, bottles and cans strewn about the beach. All brought in locally and from overseas by the tides; a dramatic reminder that majority of the human population contributes to the trashing of the environment. 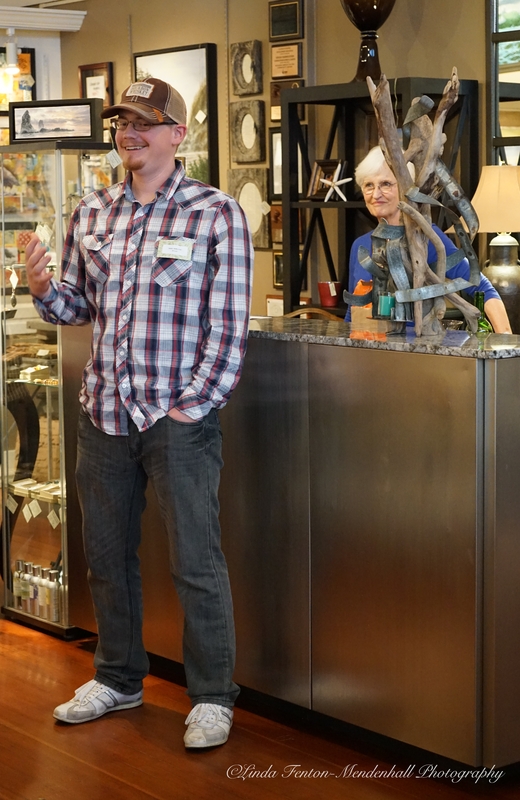 And, too, Robert McWhirter returned in a special encore appearance during Fairweather’s COLLECTIVE ENERGY opening reception on September 05, 2015 to lecture about his incredible artistic journey. Q: How do we find the artists that show at Fairweather’s, you ask? A: Here is a word-for word narrative: “My wife and I have been in your gallery and I would love to have some of my work presented, if you are looking for new local artist. I am a welder by trade (you may remember speaking with my wife and I almost a year ago). After talking with you, I have created some work using unique wood found in the northwest and combining it with handmade steel work. We would love to show you the pieces, if you are interested. I look forward to hearing back from you.” Robert McWhirter –August 2014. “The best building materials are all around us, they just need to be found” – Robert McWhirter. Congratulations, Robert McWhirter! You are no longer an emerging artist…you have become are a renowned artist!!! Introducing emerging artist Gayle Seely. 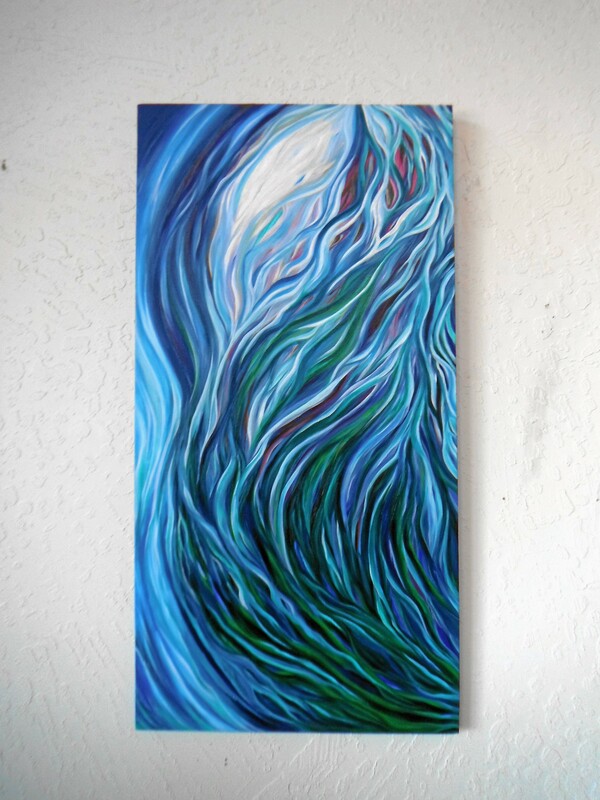 “Deep Blue”, 36″w x 18″h, original oil by Gayle Seely. Through Gayle’s art there is “such liveliness in bright colors, offered, perhaps, as a true stimulant to the imagination. Through her art and story, she has the power to directly influence the soul.” — Denise Faiweather. “I create art for the love of seeing and feeling colors and shapes coming through my emotions. In expressing my internal dialogue in a concrete way, I create fresh perspectives otherwise hidden. As a native Oregonian, my eyes are open to the natural beauty and ever-changing light surrounding me. My style developed over years of simple but profound outdoor and interior moments, expressed in an honest, straightforward, flowing way.” –Gayle H. Seely. 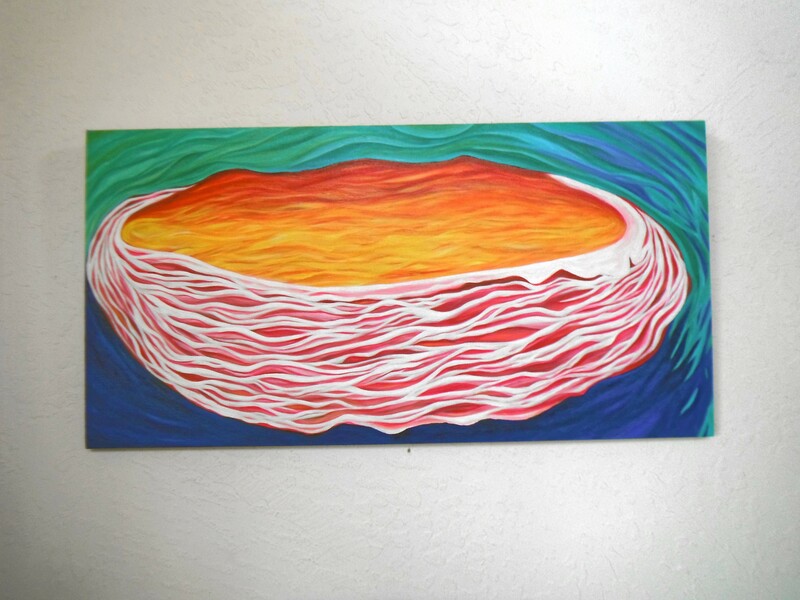 “Colorful Nest”, original oil by Gayle Seely. And, too, celebrating its 9th year in 2015, Fairweather House and Garden, located at 612 Broadway, in the heart of downtown Seaside, becomes Fairweather House and Gallery! We are thankful and grateful for many artists, patrons, visitors and residents. So, then, the jostled and converged name re-invention is due to tremendous support for the arts! As a gallery, Fairweather’s will continue to reflect the eclectic collection of significant and emerging Northwest artists. As a gallery Fairweather’s will continue to serve the historic Gilbert District as vortices of creativity, inspiration and commerce. As a gallery, Fairweather’s will continue to offer a wide array of painting, sculpture, photography and other media from classic realism to cutting edge contemporary and conceptual art. What is steel ribbon art work, you ask? A Look Inside Steel Ribbon. 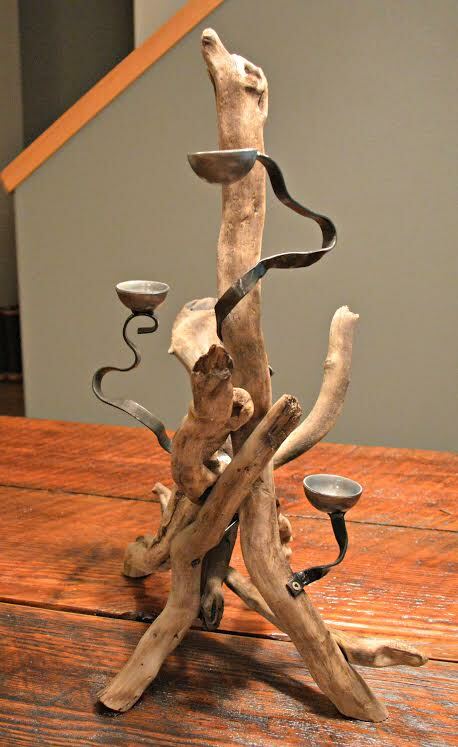 Creating art from found and salvaged materials can be a tedious task however the end result can prove to be extremely rewarding. “Here is some background on what goes into the Steel Ribbon series. The wood is 100% collected drift wood off the north Oregon Coast. More specifically Fort Stevens State Park on the north side of the jetty. The wood found here is unique in that not only does it drift in from the ocean on high tide, it also drifts in from upriver during outgoing tides, providing a wide range of woods in various stages of water travel. The metal used in the sculptures is a hot rolled, mild steel flat bar used primarily by fabrication shops. Most of the steel I use is salvaged scrap from local welding businesses, usually left over from railing or commercial sign projects. The term hot rolled steel comes from the process of forming the molten steel into its final shape while it is glowing hot which is around 2,000 degrees Fahrenheit. This process is done exclusively by the steel manufacturing facility. Mild steel refers to the elemental contents of the metal. While there are countless variations of elements used to produce steel (carbon, chromium, nickel, etc..) mild steel is the most common and widely used around the world. Artist Paul Brent and Lana Jane Brent meet emerging artist Linda Garland. 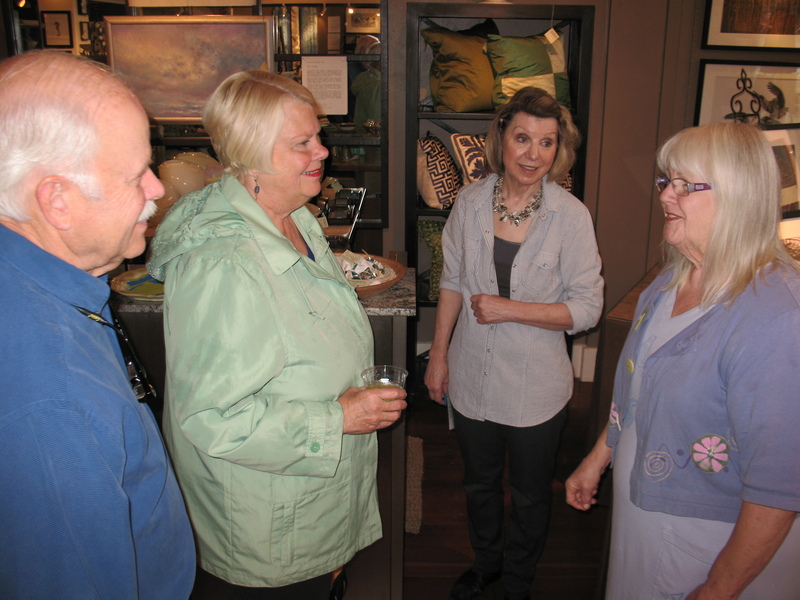 Of Note: Linda first introduced the concept for a permanent NW art collection to be offered in the River Inn at Seaside. Paul Brent’s art is featured in the hotel. Linda works at Inn at Seaside, a sister hotel, went to the same college as Paul and will be Fairweather’s emerging artist in August. So, then, save the date August 2nd, Fairweather’s will host TWO Art Walk’s. One: BELONGING at RIVER INN at SEASIDE with the artists that were appointed to offer art work for Seaside’s newest hotel with artists Paul Brent, Neal Maine, Victoria Brooks, and Penelope Culbertson. Guest speaker: Melyssa Graeber, Necanicum Watershed Council Executive Director. TWO: EMERGING at Fairweather’s. Emerging artists and emerging new work by resident artists. It’s truly a connected world at the beach.